Lt. Governor Moses Leverock with his second wife Mary Ann Winfield. 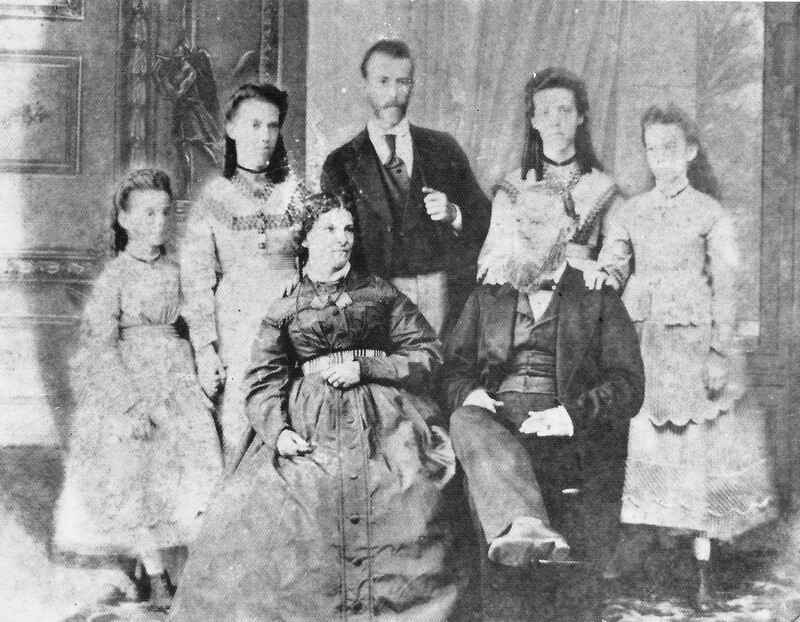 By his first wife Ann Rebecca Beakes he had three children and by his second wife three (five of them pictured here. )He was Lt. Governor of Saba from 1863 until he died in 1875. In going through some old documents from the 1860’s I found lots of correspondence between the Governor J.D. Crol on Curacao and Lt. Governor Moses Leverock on Saba. When Moses Leverock was Lt. Governor he carried out this Honorary function from his home in The Bottom. There was no salary to speak of then. One of his predecessors of the Beaks family had to operate a pirate ship in order to maintain his family so that they would not have to starve. 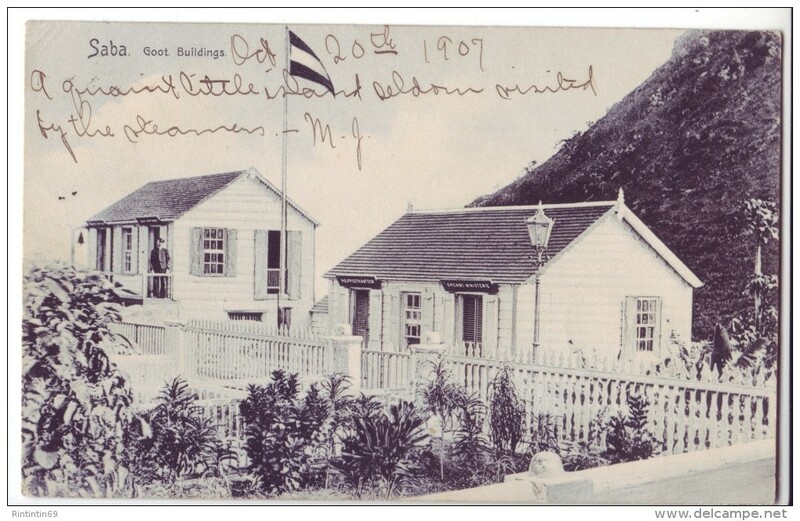 These two buildings came about around 1890 or so and served as the Post office, and office of the Lt. Governor and the other building was the police station and the jail. Typical Dutch thinking. In our new status the first things the Dutch did was to build new jails and strengthen the Police force and send out new immigrants to harass the indigenous people of the islands. Remarkably enough for those times when the Governor on Curacao considered himself as a sort of Viceroy for the Dutch West Indies he recognized that Saba was an English speaking community. Even resolutions and various laws were translated into English to accommodate the Lt. Governor of Saba. In those days also Saba was Dutch only on paper. The small budget of around one thousand guilders per month was brought up by the residents of Saba. In 1865 there were 1.809 people living on Saba, all of them born here with about five foreigners living here. There was a delegated court of justice on Saba and an appeals court on St. Eustatius. Our local people were in charge of everything. Compare with today. Everything is in Dutch sent out to an English speaking people. No respect is shown for our history or our culture. Several Dutch wealthy people have set up a so called “Saba News” in order to put the Saba people to fight one another so that they can take over the islands resources and land which has been held in a sacred trust by the indigenous people for over four hundred years. We will deal with these situations in another forum, but for now I just want to bring to the attention of our Dutch colonizers that we have a history, a culture and there was respect for that in former times. Not so anymore. Here follows some of the correspondence from the Governor on Curacao, J.D. Crol. “I have the honor to request you to inform the medical practitioner Klappers at your island that all medicines etc. required for the gratuitous treatment of the poor, the marechausees etc. are not to be furnished by him, but that he has to send in a proper acquisition list by your medium. When those articles will be furnished from the government hospital in their place. The Governor etc. was signed J.D.Crol. Pieces 4 In compliance with the request contained in your letter of the 8th ult. N.69, I have the honor to enclose to you a provisional Instruction and provisional Tariff for the medical practitioner in your island charged with the local medical services. You are requested to send the same over to Mr. Klappers for his guidance until a legal provision by the Supreme Government in Holland on the services of the local medical practitioner in the Dutch Windward Islands which soon is expected, shall be received. With respect to the medicines etc. required for the medical attendance of the Marechausees, police agents and the poor, I have the honor to refer to my letter of 30th June last Nr. 67 – 9/22, while for those until now Mr. Kloppers he may present his bill, to be through your medium submitted to my approval. Enclosed you will also receive English translations of said instructions and tariff for your information. “It is with deep regret that I have been informed by your letter of the 6th instant No. 19 of the death of Doctor Klappers. I have made the Minister of Colonies acquainted with this loss at the same time requesting his Excellency to provide in the want of a medical man in your island. With regard to the medicines sent by Government for the treatment of the poor of which Mrs. Kloppers agreed to keep charge being at the same time willing to give any simple dose that may be required, I leave it to your judgement to act according to circumstances for the benefit of the poor. The Governor Etc. J.D. Crol. In answer to your letter of the 9th inst. I have the honor to inform you, that the passage money to which Mrs. Kloppers is entitled amounts to f 250.—for herself and f. 125.—for each child under 12 years of age. His Honor the Gezaghebber of St. Eustatius will be authorized by me to pay out said amounts whenever Mrs. Kloppers shall make up application for the same. The Governor. J.D. Crol. In answer to your letter of the 10th instant No. 43 I have the honor to inform you that it will be best to keep the government medicine left by Mrs. Kloppers until another physician shall be appointed for Saba to whom then these medicines may be given over. 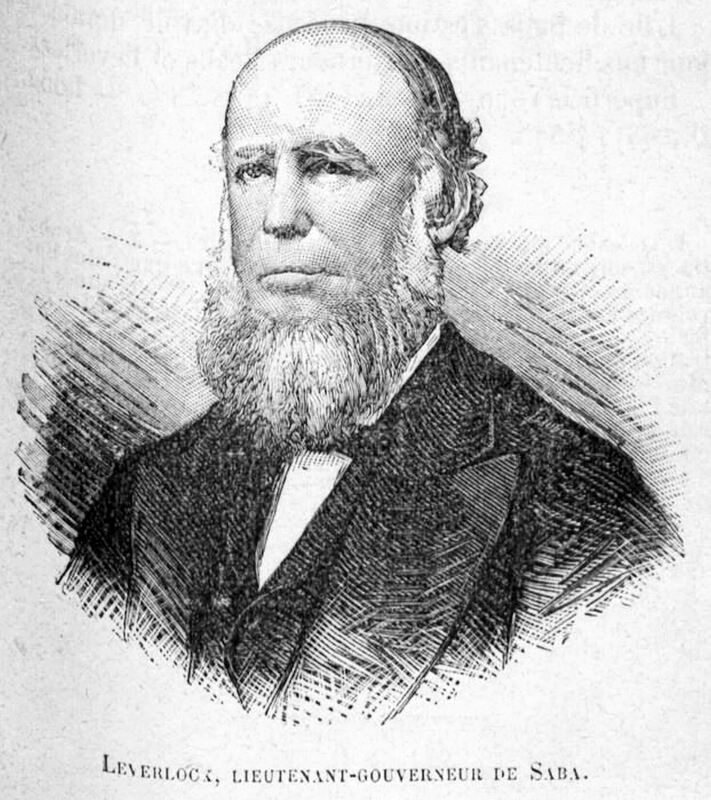 The Governor J.D.Crol. No. 85 – 25/46 Letter sent by schooner “Harbinger” on August 7th, 1865. ** The large schooner the “Harbinger” was built on the Tent Bay by Capt. Solomon “Coonks” Simmons in 1861. He was assisted by John and his brother Phoenix Simmons. I have the honor to request you to forward to me by the first opportunity an extract from the Register of Deaths of your island, concerning the late Dr. J.W. Kloppers. Sent by schooner 22nd October 1865. Signed Governor J.D. Crol. Acknowledging the receipt of your letter of the 23rd ult. Nr. 79 with one enclosed from the Medical practitioner de Wilde, I have the honor with reference to my letter of June 30th, 1864, Nr. 67/22 to request you to inform said Mr. de Wilde that the medicines etc. required for the gratuitous treatment of the poor and Marechausees are not to be furnished by him, but that he has to send in to the government as soon as possible a proper statement of whatever medicines etc. may be required for that purpose in order that they may be forwarded to him by the first opportunity. You are further requested to communicate to Mr. de Wilde that his correspondence with this government is to go through your medium under cachet Volant and not by closed letter in order to enable you if it should be required to add your considerations to the same without loss of time. Of Saba from the Governor J.D. Crol. *From this letter you can see that RESPECT was shown to the position of the Lt. Governor of Saba back in 1865. Mr. George M. Brown lately from your island, arrived here a few days ago and applied to me complaining of having been forced by the authority of Saba to leave the said island within a given time. On perusal of the various authentic document exhibited to me by the said Mr. Brown, it appears that this measure has been taken by you on the grounds of articles 11/14 of the decree of the 3rd March, 1831 no. 69, articles 11/14 of the decree of the 3rd March 1831 no. 69, and article 49 of the Government Regulation of 1848 No. 51. I must however observe that Mr. Brown having resided on Saba for upwards of three years without hindrance or disturbance, and whereas it does not appear Mr. Brown has ever previous to the 17th of October last, officially been intimated to comply with the formality required by the said law of 1831 and 1848, consequently must have been considered having virtually (de facto) been admitted by the authorities of Saba: the stipulation of the articles of the laws above alluded to, cannot reasonably be enforced any more against Mr. Brown at all events before resorting to such an extreme measure as expulsion. Mr. Brown ought to have been allowed an opportunity as yet to comply with the requisite formality as prescribed by the decree of 1831g184C. “It also appears by the warrant dated Saba 5 December 1865 and signed by the Recorder of the Delegated Bench of Justice that the measure against Mr. Brown has been taken in consequence of the contempt with which he had treated the authority of the Government of the island whilst it appears that for this very offence he has been prosecuted by you before the Delegated Bench of Justice and the said Bench by a sentence dated the 17th October 1865, declared itself incompetent to decide said cases and referred the parties to the Bench of Jurisdiction at St. Eustatius, now it is obvious that, instead of transferring the matter on political grounds the case ought to have been prosecuted by you before the Tribunal of St. Eustatius, and if so a legal sentence ought to have been rendered in the case but by a mere letter addressed by the Officer of the Public Ministry at St. Eustatius to the Delegated Bench of Justice for St. Eustatius and Saba, did not think the case brought by you against Mr. Brown, susceptible of being tried by that Court, as you had the authority and rights to send away any stranger who for legal reasons is to be looked upon as hurtful or mischievous and consequently to refuse further habitation in Saba to Mr. Brown, you could in no wise consider yourself authorized to resort to the step you have taken. “I cannot at the same time abstain from expressing my surprise not having received any information from you on the subject, the warrant by which Mr. Brown was ordered to leave the island being stated the 5th December 1865 last, and your last official dispatch to me the 11th. “On all these preceding grounds, and moreover taking in to consideration that it does not appear Mr. Brown has, during the three years of his sojourn in your island ever before given any cause for complaint, even your dispatch of 18th August last Nr. 59 containing nothing prejudicial to his private character, I permitted Mr. Brown to return to Saba on condition to conduct himself in a quiet and honorable manner. In conclusion I beg to observe that as a consequence of the new Government Regulation which has entered in force the 1st of this month a new publication on the right of admitting and expelling of persons who are neither established in the different islands of the Colony must in the meantime earnestly recommend you the caution in resorting to any similar extreme measure as that of expelling without previously ascertaining the opinion of the Chief Government on the subject, as even International Interests may be jeopardized by it and consequently involve the Government in the most serious difficulties. To His Honor the Gezaghebber of Saba From the Governor Etc. In connection with my letter of this date Nr. 1/1 I consider it not superfluous to observe to your Honor, that in my opinion Mr. Brown could not have been prosecuted in Saba for the payment of a debt contracted in the Danish Island of St. Thomas, such prosecution ought to have been instituted by the interested party in St. Thomas itself. This lithograph of Governor Moses Leverock is taken from a French Haitian book on Geography. He is the only white man pictured in the book, the rest are Haitian national heroes. The book is from the mid 186o’s. Gezaghebber of Saba from the Governor, J.D. Crol. *** I must note here that back then Saba was much more dependent on St. Thomas than on the Governor on Curacao which office around that period until the early nineteen hundreds had never even paid a visit to the Dutch Windward Islands. The point of this article is to demonstrate that RESPECT was shown to Saba and its people by recognizing that we were an English speaking people. Not so anymore it would seem to be! !